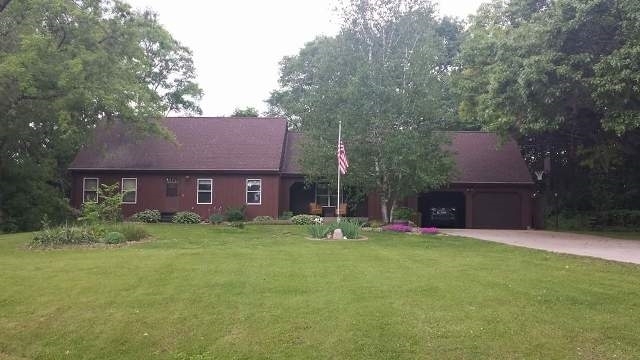 7209 Birchwood Dr, Sauk City, WI.| MLS# 1843312 | John Reuter Realtor/Broker/Owner of The Reuter Team. Wisconsin Homes for Heroes Realtor. Proud to be the Top Homes for Heroes Realtors in Wisconsin and One the Top Homes for Heroes Realtors in the United States. Here is a little country but easy access to Madison and town. Wooded back yard with privacy in a rural subdivision on a quite cul du sac. Cozy family room with woodburning fireplace for those cool fall evenings. The walkout basement is unfinished just waiting for your touches to add to the great family home. There is a bonus room that could be a non conforming 4th bedroom, Office, Playroom. Eat in Kitchen open to your Deck. New Septic Drain Field installed in 2017. Directions: Hwy 12 From Sauk City Towards Madison, Right On Hwy Y, Right On Birchwood Drive. Items Included: Stove, Refrigerator, Dishwasher, Microwave, Garage Door Opener, Water Softener, Washer & Dryer, All Window Coverings, $450 Uhp Home Warranty.